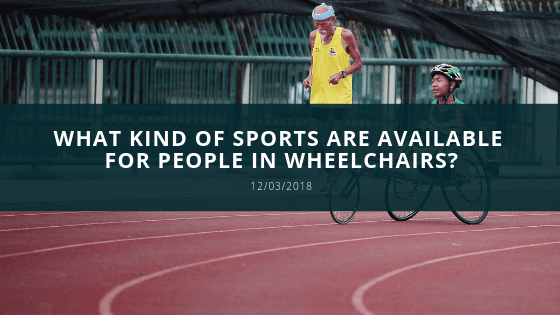 There is a wide range of sports that are available to people in wheelchairs that can be played for fun or in competition. Sports available to wheelchair users are basketball, rugby, tennis, and not limited to water skiing, motocross, or racing. Each sport has been modified the littlest possible in an attempt to allow those without the ability to use their legs play something they like. Some sports have been adopted by wheelchair users earlier on while others are not as popular yet. Throughout time sports are becoming more wheelchair friendly and with the use of technology new equipment is being developed to help increase mobility. This has given wheelchair users have the opportunity to show off their skills and gain the sense of accomplishment through their hard work. The sport that is most common among wheelchair users that want to be safe by not being physical or rough is tennis, cycling, paddling, badminton, and bowling. These sports provide the entertainment and spark up the competitive side of one but does not deal with rough activity rather deals with skills. Some sports that are extremely common all around the world are wheelchair basketball, hockey, football, cross-country skiing, and power soccer. These sports are a bit more dangerous due to the physical contact and higher risk of getting hurt. These sports are played in the Paralympics and require special equipment that provides balance, stability, and additional mobility. Other sports that are entertaining and competitive yet dangerous are motocross water skiing and snow skiing. These sports include speed and dangerous tricks which if not done properly can cause injuries. Motocross is most dangerous from all sports because the athlete uses their special wheelchair to gain speed to go over ramps and perform tricks that include him/her going up into the air and spinning or twisting them landing. Gloves and helmet are used however lost of control can cause the athlete to fall off their chair and onto the concrete or wooden flooring. In each sport there are different levels of skills requires and most importantly clearance by medical doctors when competing. Each sport definitely enjoyed because it gives individuals the opportunity for something to look forward to and to be a part of a team that shares similar experiences. It is a way for wheelchair users to be social and showcase their skills to the rest of the world and become an inspiration to many. What Features Would You Add to Improve Electric Wheelchairs?